Angular Input Output decorators are very important while establishing a relationship between parent and child components in our applications. While developing our project, sometimes our components may become large and hard to read. So, it is always a good choice to split that big component into a few smaller ones. Furthermore, smaller components can be reused into other components, therefore creating the parent-child relationship is a very good idea. Child component depends on the parent component, and because of that, they make one coherent part. Creating child components by using Angular Input Output decorators is going to be our goal in this post. If you want to see all the basic instructions and complete navigation for the .NET Core series, check out the following link: Introduction of the .NET Core series. 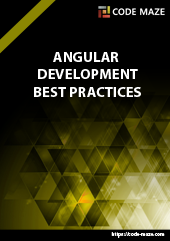 For the complete navigation and all the basic instructions of the Angular series, check out: Introduction of the Angular series. In the situations where we want to send some content from a parent to a child component, we need to use the @Input decorator in a child component to provide a property binding between those components. Moreover, we could have some events in a child component which reflect its behavior back to a parent component. For that purpose, we are going to use @Output decorator with the EventEmitter. To handle success messages and error messages (which are not 500 or 404 messages), we are going to create a modal window child components. We are going to reuse them in every component that requires displaying these types of messages. When you want to register your reusable component it is a good practice to create a shared-module and to register and export your components inside that module. 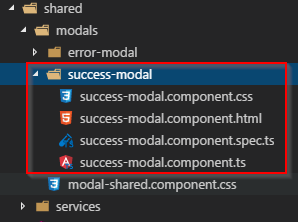 Then, you can use those reusable components in any higher level component you want by registering the shared module inside a module responsible for that higher order component. 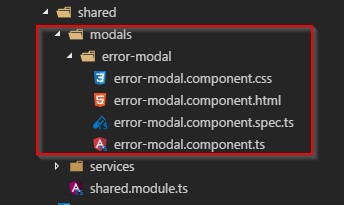 Let’s start by creating the shared module in the shared folder. In the modals folder, create one more CSS file with a name modal-shared.component.css. We are creating this file because we are going to have the same CSS for error and success modal windows without repeating the same code in two different CSS files. We are decorating our properties with the @Input decorator and by doing so our parent component can set values to these properties by using property binding. The @Ouput decorator with the EventEmitter is used to emit an event from a child to a parent component, and that is exactly what we want to do. 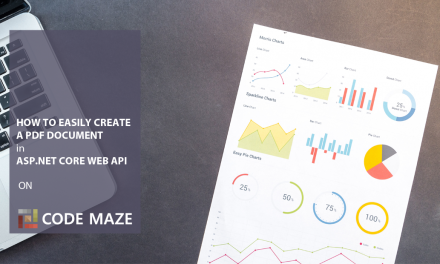 We are going to use success component when create, update or delete action is completed successfully and by pressing the OK button we are going to redirect a user to the owner-list component. For this emitter to work, we need to make the subscription in the parent component to this emmitEvent function. This is going to be handled in the next lecture. <app-error-modal [modalHeaderText]="'some string in here'"
[modalBodyText]="some property from a component in here without single quotes"
We are including selector <app-error-modal> from our child component, and setting up the @Input properties within the square brackets (Property binding). To set up a value for the property binding, always use double quotes and then specify the value between them. If we want to pass a string, then that string must be wrapped inside single quotes first. Now that you know how to use child components, you can split the owner-details component into the parent-child relationship. Try to do that on your own, because the practice is the best way of learning things. Of course, you can find this implementation inside the source code for this blog post. As you might have noticed, our owner has a dateOfBirth property which we need to work with, in our Create and Update forms. It is going to be just an input text element on the form, but it is going to have a different behavior. We are going to use it as a date-picker. We could change its behavior in both components (Create and Update) separately but we won’t do that. For that purpose, we are going to create an Angular directive so we could change the behavior of that input field. In the shared folder, create new folder directives and inside create a new file datepicker.directive.ts. Don’t forget to import this directive inside the shared module in the declarations and exports array. Thank you for reading the post, hopefully, it was helpful to you. In the next part of the series, we are going to start with the creation of the owner and form validation. I have created the datepicker.directive.ts as per blog. But when i am trying to run app. I am getting below error. src/app/shared/directives/datepicker.directive.ts(12,5): error TS2304: Cannot find name ‘$’. Have you installed jqueryUi and typings for it? 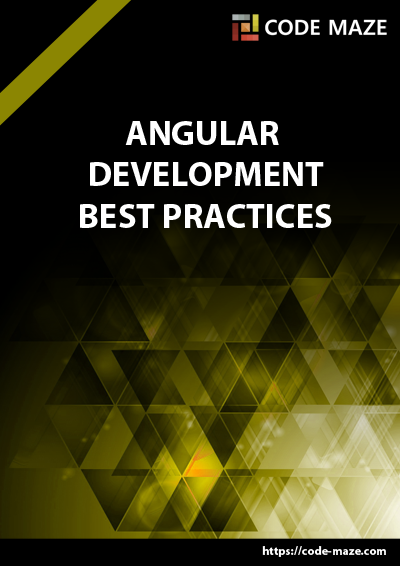 As we have explained in the first part of Angular series. Yes I have followed all the steps mentioned in all article. Well, the $ sign is a helper (you will read syntactic sugar) for the jQuery and jQueryUI libraries. With it you can call all the functions and properties from those mentioned libraries. You can check that by typing $ anywhere in your directive, you MUST see the intellisense with all the methods and properties. If you don’t see that, than you didn’t install all the stuff it needs. So, when I read your error, it seems to me that either you didn’t install jQueryUI or its typings or you didn’t place the reference to jQueryUI library in th angular.json file or its typings in the tsconfig.app.json file. If you can’t find the error, please upload your code and I will review it.